Russian athletics will co-operate "in any way" to prove it is clean, says Sports Minister Vitaly Mutko. Athletics' governing body is discussing what action to take against Russia after they were accused of "state-sponsored doping". The IAAF is considering whether to implement a World Anti-Doping Agency (Wada) recommendation to ban Russian athletics from the 2016 Olympics. 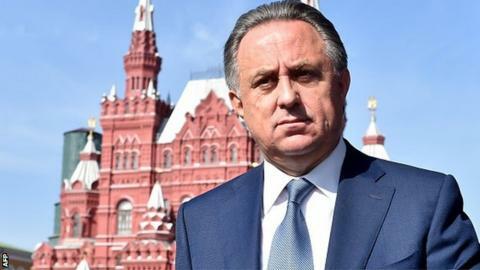 Mutko said Russia is willing to do "whatever the IAAF says". "I guarantee - in the name of the state - that we will co-operate in any way to sort out the athletics federation in the shortest possible time," he said. "If we need to change everyone there - we will do it. But to wipe Russian athletics off the map? We don't agree with that, of course." Wada's independent report, released on Monday, examined allegations of doping, cover-ups, and extortion in Russian athletics, which also implicated the International Association of Athletics Federations (IAAF). It also recommended that five Russian athletes and five coaches should be given lifetime doping bans. The athletes and coaches named are yet to respond to the report's findings, and the allegations are unproven. Russia hopes to prevent its athletes being banned from next year's Olympics by claiming "irregularities" around its drug-testing system were down to the sport's "old leadership". Mutko said Russia will not boycott the Rio Games should the country's athletes be barred from competing, but argued a collective ban would be "ridiculous". Yelena Isinbayeva - the pole vault world record holder and one of Russia's most decorated athletes - wrote an open letter before Friday's IAAF meeting. She said denying Russian athletes the chance to compete would be "unjust and unfair". Isinbayeva ended the letter by writing: "I believe that they will make the right decisions. The guilty will answer for their actions, and the innocent will be able to continue to serve and represent our country in all international sports arenas."